(I'm wearing three coats in the pic - tho I could have gotten away with two me thinks.) Also, this first pic was taken with my camera, so the colour is more accurate. Andddd... Since I can always use the practise, I thought I would try more flowers. I was pretty happy with the result but will definitely be practising more. So watcha think? 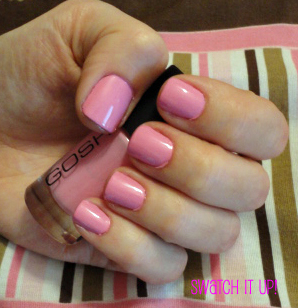 What's your go-to pink polish? No go-to pinks here. lol. I've got one bubblegum pink I bought on a whim that I swatched on one finger and have yet to do anything else with, and a baby pink I want to buy and try. There are so many lovely pinks out there, I'm just not convinced any of them are for me. Actually the bubble gum was one of those polishes I bought on a whim... I would never normally buy such a colour let alone wear it lol. Adorable flowers! My go-to pink would probably be OPI-DS Extravagance, but that's much darker. I don't have any baby pinks. I should get some! 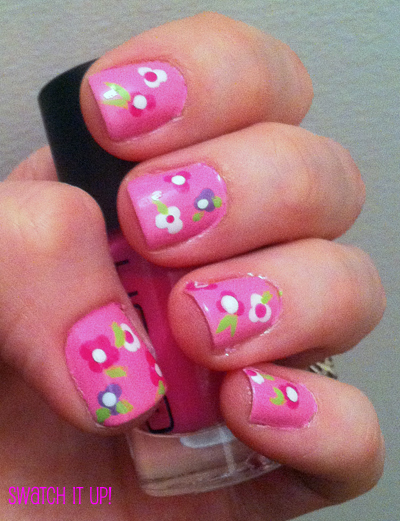 That's adorable, I love the flowers :3 It's really hard to find a good pink that isn't streaky, isn't it? I usually go for Sally Hansen I Pink I Can but I've been looking for something paler lately. Maybe I'll give this one a go!